Nikka Taketsuru 21 years old has been ranked the world's best blended malt whisky during 4 years in a row. It is an exceptional Japanese whisky with unique flavours. 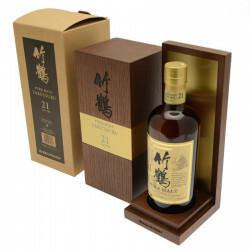 Multi-award-winning, Nikka Taketsuru 21 years old is a exceptional pure malt whisky. It has been ranked the world's best blended malt whisky during 4 years in a row. It is a whisky that pays tribute to the Master of Japanese whisky, Taketsuru. This incredible blend of Single Malts including the Nikka Yoichi and Miyagiko, is rich, round and greedy. It expresses passionately fruity and woody notes that will delight experts and novices. Colour: Gold with green highlights. Nose: it expresses aromas borrowed from iris and honeysuckle with a clear, lively and powerful character. Raised by candied citrus fruits such as orange and lemon, it is powerful with its hint of peat with a light and pleasant bitterness. It then evolves on vanilla, new oak and menthol notes. Palate: sweet and balanced at the beginning with spices (cloves, nutmeg) and hints of dried fruits, it evolves on ripe fruits (pear, apple), vanilla and exotic fruits (pineapple, persimmon). Its ardor is balanced by praline touches and dried fruits (almond, cashew nuts). Finish: Long and tender, it is marked by vegetal and fresh notes, as well as by green licorice. Gourmet, it continues on mocha, acacia honey and spearmint. Its saline character is gradually gaining momentum. Elected Best Blended Malt in the World at the 2011 World Whisky Awards. Gold Medal at the 2012 Spirits Challenge.